Will never hear the words “Candy Cane” without thinking of this movie ever again. Lewis (Paul Walker) is wrapping up his freshman year of college, and is prepping to come home. Originally flying, Lewis calls an audible and instead buys a car to drive home. His reason? His crush, Venna (Leelee Sobieski) needs a ride home from college in Colorado. His best-laid plans go out the window when he feels obligated to pick up his troubled older brother Fuller (Steve Zahn) out of jail. On the way to picking up Venna, the brothers decide to have a little fun during their Joy Ride with a truck driver known only as “Rusty Nail” over a CB radio. But when the prank goes much too far, Lewis and Fuller will be lucky to make it to Colorado, much less home. Though it is awesome if they are, thrillers don’t have to be elaborate nor stocked to the brim with twist after twist. They just have to thrill and provide tension. 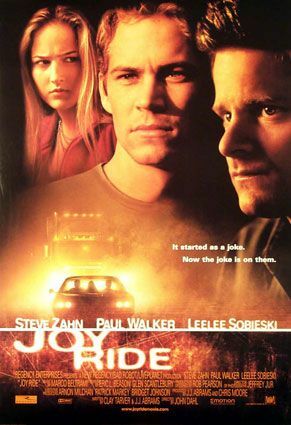 2001’s Joy Ride is very simplistic in its execution. Want a fun point A to point B horror/thriller? This is it. Co-writers J.J. Abrams and Clay Tarver along with director John Dahl (Rounders) go in with the less-is-more idea with Joy Ride. It is fascinating how much mileage they get out of a simple premise of prank calling—err—cb “radio-ing”—going wrong. There are no hidden meanings or truly meaty characters. The great Roger Ebert said it best, this is essentially Halloween (and of course being influenced by Steven Spielberg’s Duel from 1971). What you see is what you get…which is often white knuckle thrills that build and build to an impressive climax. If there were but one notable issue, it would be the actual ending. While not completely ending abruptly, it would have been nice to actually see some aftermath of the ordeal. Additionally, some of the actual end events fall a little into what I like to call “God Mode” territory, where one character is everywhere and can do anything and knows everything with little explanation as to how. Joy Ride feels a lot like film noir, just without the notable characters, detailed plot, or voiceover narration. John Dahl bathes a lot of the film’s biggest scenes in red and/or a torrential downpour, giving the movie a consistent feeling of danger and dread. It’s well paced also, giving enough quiet moments for said danger and dread to be of impact. Marco Beltrami’s score certainly isn’t subtle, but it does enhance some of the more harrowing parts. The audience never gets a good glimpse of Rusty Nail, psycho trucker extraordinaire, but we certainly hear a lot of him, which may be just as frightening, if not more so. Rusty Nail is voiced by none other than Buffalo Bill himself, Ted Levine. His gravelly-based voice is the stuff of nightmares. The people on the receiving end of his threats are Paul Walker and Steve Zahn. The duo are believable enough as caring yet dysfunctional brothers. Like some of his other early movies, Walker isn’t asked to do a ton, but he gets by with charisma and likability. 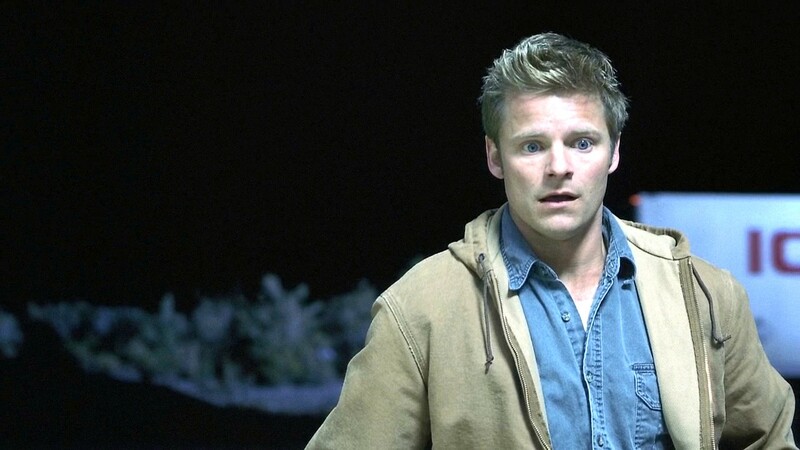 Steve Zahn, for my money, has always been one of the more versatile actors in Hollywood. Here, he’s a little comedic as the jerkish older sibling, but still possessing the chops to sell terror adequately. Leelee Sobieski is quite the pretty face, but awfully forgettable as a thespian. But one shouldn’t view Joy Ride expecting great performances, but rather, to get some surprisingly well executed thrills through a simple premise. I enjoyed this ride much more than expected. Photo credits go to imcdb.org, impawards.com, ign.com, and hotflick.net.